In stock 37 items in stock. The Teensy is an amazing and compact development platform in a breadboard friendly form factor, but what if you could incorporate it into the Arduino architecture? The Teensy Arduino Shield Adapter allows you to attach your Teensy and utilize your favorite Arduino shields without the requirement of a breadboard or any complicated wiring. Needless to say, the Teensy Arduino Shield Adapter is a useful tool for upgrading all of your existing Arduino projects to a more powerful controller! As we stated before, the Teensy Arduino Shield Adapter provides basic Arduino compatibility with your run-of-the-mill shield but there are a few other fun features that we've added on, as well. These features include a Real Time Clock (RTC) battery, a JST battery connector, a 4-12V barrel jack connector, an ICSP header, and more. Because this board is simply an adapter, there is no special programming required to start working with the adapter. You will, however, need to program the Teensy for any Arduino shield you’d like to work with. While the adapter design can fit the Teensy LC footprint, it has been designed to fully utilize the features of the Teensy 3.1. Not all of the features available on the adapter are compatible with the LC so please be sure to check the Hookup Guide in the Documents section below to ensure functionality for your project. Please keep in mind that this adapter may be incompatible with some 5V Arduino shields. Please check our hookup guide for more information. Note: The Teensy Arduino Shield Adapter comes as a kit and will need to be soldered together. Note: Due to the requirements of shipping the batteries in this kit, orders may take longer to process and therefore do not qualify for same-day shipping. Additionally, these batteries can not be shipped via Ground or Economy methods to Alaska or Hawaii. Sorry for any inconvenience this may cause. 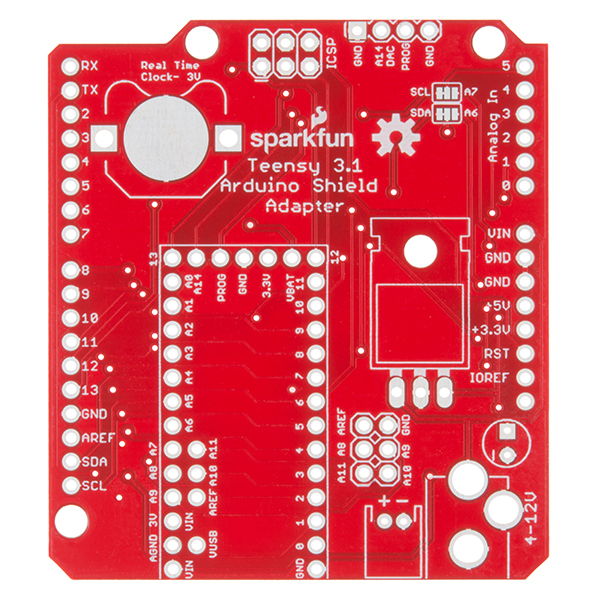 A basic introduction and assembly guide for the SparkFun Teensy Arduino Shield Adapter. I purchases board to use with the project that needed DAC. I need to amplify this voltage to 10 V, so I needed a proto-shield to accommodate a op amp. I have several generic proto-shields that have a .1 standard pin spacing. While trying to determine where my headers should be placed, I noticed the pin spacing for the DAC output did not line up at all. It was .05 off. I also noticed that other header pins that needed to be attached to a proto-shield was slightly off. 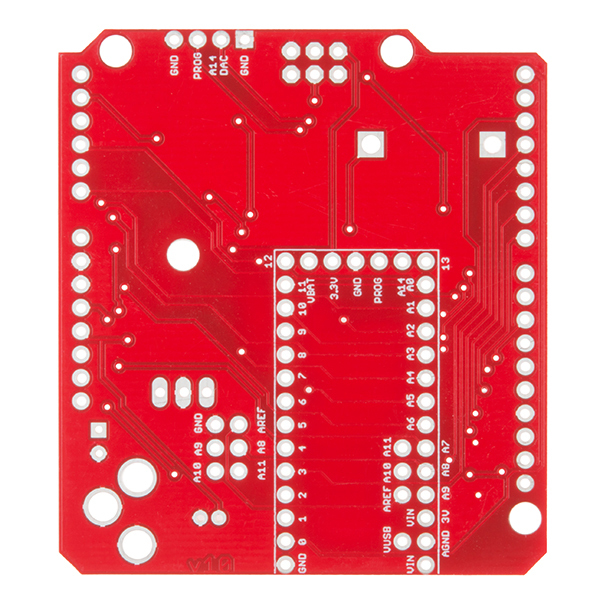 This can make it difficult to use a standard proto-shield with your boards. Certain pins will be slightly out of alignment, even with the extension headers. The board is still usable, but I expected a standard pin arrangement for all pins. I suggest you use the standards header pin spacing on all your shields/adapters. This board was designed specifically to allow you to use an Arduino shield with a Teensy board. The off spacing is actually a feature/bug of the Arduino footprint. In order to make this compatible with Arduino shields we had to use the same spacing. Sorry for the trouble. Please read my post again. I did not mention anything about the "Arduino" pin layout. I was referring to the way you placed the additional pins on this board. Specifically the DAC pins. This is a 4 pin arrangement that is .05" out of alignment with the rest of the standard pins. the other header pins that you placed on this board are also slightly out of alignment. But not enough to be concerned with. But it does show a lack of attention to detail. something that has shown up on some of your boards. Some of which has prevented me from purchasing a particular board. in my case, I know of a couple products that I have chosen not to purchase because of lack of attention to detail. And in at least one case, I believe the Person was half drunk when he designed it. How it got past design review is a different Question. I am just going by the comments left for that board, I believe several others have chosen not to purchase it as well. I'm not sure if you still have the beer keg available to your employees, but maybe it's time to get rid of it, or at least limit access to it till after business hours. your reputation is at stake here, which is a big part of your company. you can have a reputation for designing and producing good products or products that have not been thoroughly thought out. Or even dangerous, Which is a whole separate issue. Again I have no problem with the Arduino board layout. It is what it is. It is your pin placement that I have a problem with. I found another problem on this board. this time it is with the Arduino footprint. The two mounting holes on either side of the ICSP header is out of alignment. And approximately 2.9mm too wide. Not a big deal for most, but if you're mounting it to avoid vibration like I am, it becomes a big deal. especially since these are the only two usable screw holes on the board. The third mounting hole is so close to the headers that it is almost impossible to use. but this is an issue that plagues Arduino as well. It is the two mounting holes on either side of the ICSP header that concerns me at this point. I noticed this board has to use tall headers inbetween so the shield above clears the teensy. You might want to use swiss machine pin headers on the teensy instead, they are lower profile. You could also probably solder the taller headers directly to the adapter instead of having them in between. Just an idea. Both great ideas! There's really a large number of variations on how you could put this together - but like every product/project, there's always room for customization! It's been submitted to our product suggestion team, so hopefully we'll get one out in the future! Do you mean a shield adapter for Pro Minis? That's great feedback - thanks! I've gotten started on something like this. See https://github.com/Sembazuru/Pro-Mini-to-UNO for my KiCAD files as they stand. It isn't complete, and only gets occasional work. I'll see if I can get it pushed through to Gerbers this weekend. Ok... Not finding the free time to do this quickly. I think I've finally finalized on a schematic (figuring out how to hook up regulators and provide jumpers for the 5V and 3.3V lines to make this board usable with both 5V and 3.3V Pro Minis was the hurdle there). Agreed; for prototyping this would be an excellent product. 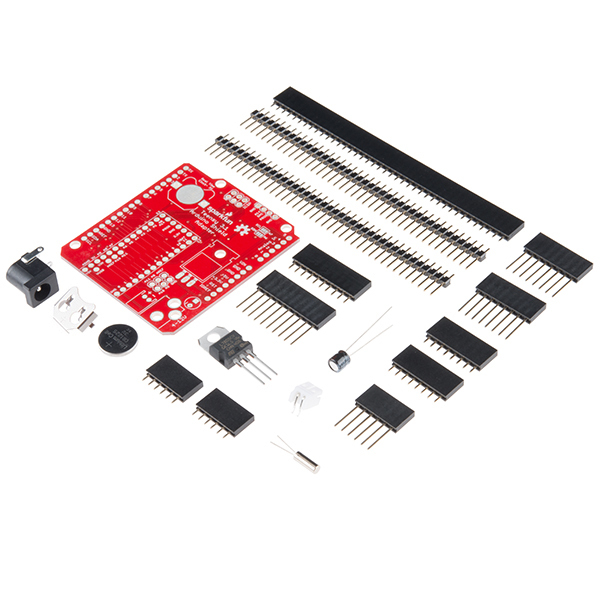 Try the Arduino Pro. 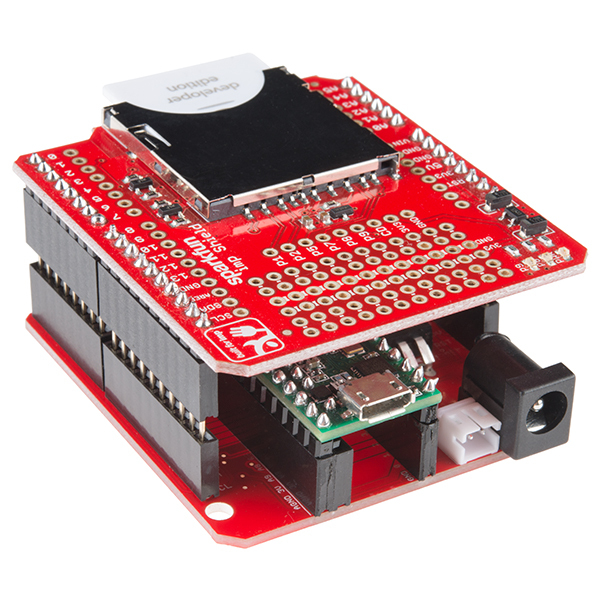 I have a feeling by time you get a Pro Mini, and even a basic shield you are going to be at or above the cost and size of the Arduino Pro, and probably close to that of the Redboard. Although I do have a Protoshield that I added headers to specifically so I could add a Pro Mini and have a shield compatible format. 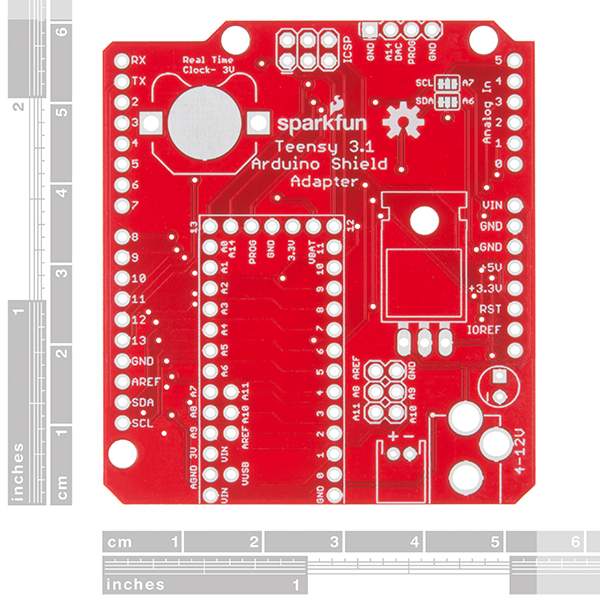 Does this shield break out the pads on the backside of the Teensy3.1? It doesn't, but if you mount the Teensy onto the shield as shown in the hookup guide, you could run wires out from those pads to the rest of your project. Nice product BUT...mounting holes do not match the hole pattern from the UNO. Hole near ICSP header is not in the right location so it is not a drop in replacement. Update: Would be nice to have resistor pads near the SJ1/SJ2 jumper pads for the I2C pull ups that the Teensy needs to have installed. I used the recommended crystal from PJRC to allow the teensy to be mounted closer to the pcb for a lower profile fit into the case I am using. The supplied crystal for the RTC is way too big. This is a very good shield. We made one ourselves for a high altitude balloon project with some students not too long ago but it will help teensy 3.x to a larger audience. I'm studying the schematic and have two questions... What do the Vin and ARef pins of the Arduino pinouts connect to? I can't find the other end of the "HV_AREF" and "VRAW" signals. Also, the Arduino IOREF pin should probably be connected to "3.3V" just in case someone makes a shield that uses the IOREF pin as it is intended by the Arduino design. VRAW connects to the input on the 5V regulator. We didn't include all the possible power configurations for the AREF and IOREF pins simply to keep costs down. It'd be up to the user to connect those to the proper power supply for their particular project/shield they are using. If VRAW connects to the input of the 5V regulator, please show it. Unless I'm misunderstanding the purpose of the IOREF pin, I thought is was a reference pin for shields to see what the I/O restrictions of the ÂµC is (i.e. to be the bias voltage on the ÂµC side of level shifters). While, yes, the Teensy3.1 is 5V tolerant, it only provides 3.3V on it's I/O pins as a logic "High", and most of the older Teensy boards are 3.3V only. If you run the command "Show VRAW", it will highlight all traces labeled VRAW in the schematic. This tool works for any signal/part you'd like to trace out on the board and schematic. Regarding HV_AREF, it is labeled to differentiate it from AREF on the Teensy. This is going to be great for prototyping; looking forward to giving it a spin. Because of the coin cell there were special shipping instructions. It took a few extra days to reach me. Maybe the board should be offered without that battery, or as an option. The 32khz crystal was a little fiddly to install, but that's a PJRC problem. Wonderful for prototyping. Note, however, that although it is pin compatible with Arduino Shields, the pinout power will still be 3.3 volts. Some shields may not like this. I'm writing this review because they sent me an email requesting it. Although the overall design, electrically is good, They need to pay more attention to the details. For instance, although electrically the Arduino footprint is good, Only one of the mounting whole lines up with the Arduino footprint. And the one that does line up, is pretty much unusable for that purpose because of the pin placement on the Arduino's. And there's not anything that Spark fun can do about that one mounting hole. but the other two mounting holes are off by about 2.5 mm between them. That is significant. also when using a standard proto-board, all pins, other than the 10 pin Arduino connector, should be lined up on a .1 space grid. The additional pins that spark fun added to the board, is not arranged on this grid. Whereas most are just barely off, the pin that contains the DAC pin is .05 off. if you are using the spacer connectors to connect the Proto-board to the Teensy adapter board, the pin spacing is not a problem. But if you are using a machined pin connector on the teensy to lower its profile, or mounting the teensy adapter on top of the proto-board, this becomes a problem. The connectors do not line up properly and has to be tilted to make the connection. This can stress the solder joints. On my application, I need to deal with vibration. So I needed to primly connect these boards together via the mounting holes. I also needed to minimize the profile that these boards take up. For these two reasons, this made the teensy adapter board unusable for me. That is the reason I am only giving them three stars for this product. I request that they please play more attention to the details.